People Share Suggestions For Things You Can Say When Your Number Is Called In A Waiting Room. 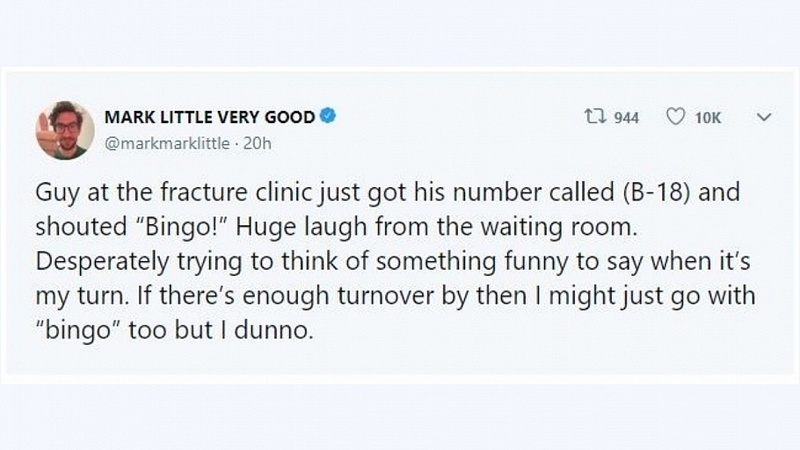 Thanks to actor and comedian Mark Little, people share suggestions for things you can say when your number is called in a waiting room. Guy at the fracture clinic just got his number called (B-18) and shouted “Bingo!” Huge laugh from the waiting room. Desperately trying to think of something funny to say when it’s my turn. If there’s enough turnover by then I might just go with “bingo” too but I dunno. Update: just got called in but it caught me off guard so I whispered “Thanks.” Gonna try to think of something to say on my way out. Possibly “doooo not go in there” but we’ll see. Just thought of one for if they fit me with a cast. Gonna tell the room “If you’re here to audition for the film, I already got cast.” Currently working out my delivery. Thinking I’ll have to hit “cast” pretty hard. Might cross my eyes a bit too. Smile to show it’s all jokes. Brutal. He said “so what brings you in today?” but i was expecting “let me guess, black ice” so I still replied “do you even need to ask.” Now he’s confused. I’ve lost the room. Might have to go into some crowd work to right this ship. Good news: on my way out, some guy's number got called and I shouted "Bingo!" before he could say anything. MASSIVE laugh. Then I pretended my foot had suddenly healed & said, "I guess laughter IS the best medicine." DESTROYED. Gonna go into my closer & then hit the road. as a guy who've work at a waiting room, i can assure you we hear "bingo" 3-5 times a day and it's the most unoriginal thing HOWEVER it's great when you have someone yell bingo on a number that doesn't work (like C-56) so you can be like THAT'S NOT HOW BINGO GOES! Francis, be honest, would it be funny if I said ‘dooo not go in there’ on my way out? How about: “THIS! IS! SPARTAAAAAA!